Sotheby’s® International Realty is proud to present a new app for Apple TV which allows users to experience an innovative and exciting new way to explore the real estate market. The app allows users to fully immerse themselves in a luxury real estate experience and explore the world’s most extraordinary properties with a expertly curated selection of high resolution photography and high definition video. Using Siri voice dictation, users can browse properties by city, state, or country or explore the lifestyle categories; whether you are interested in a metropolitan experience or you are a wine connoisseur interested in vineyards and wineries. Find a property that sparks your interest? You will be able to contact a sales associate directly through the app. Property Spotlight: A Gem in the Rough! A gem in the rough! This spectacular Italian contemporary villa is almost finished and needs last finishing touches prior to move in or resale. The potential is endless! Features include sweeping views of the sound from every room, 121 feet of low bank waterfront, a terraced outdoor kitchen with imported Italian pizza oven and top of the line appliances including a La Cornue custom range. The main residence lives on 2 levels and boasts an open circular floor plan. A 1200 square foot ADU on the lower level leads to an outdoor entertaining area and garden. Sotheby’s International Realty Affiliates LLC today announced that its global website, sothebysrealty.com, now supports 3D Tours on its property detail pages allowing real estate consumers the opportunity to fully immerse themselves in homes listed by the Sotheby’s International Realty® brand. The 3D Tours will also feature a Virtual Reality Tour (VR) experience that can be viewed through a compatible device such as an Android phone or VR headset. The 3D and VR Tours are produced by strategically placing specialized cameras throughout a home to create a result that transforms the traditional way people view homes online. The 3D and VR Tours add an additional layer of content to the existing property detail pages on sothebysrealty.com which also provide a written description, high-resolution photographs and high-definition videos. At launch, the Sotheby’s International Realty brand will have 3D Tours available on over 1,000 properties that are viewable on desktop, tablet or smartphone. The sothebysrealty.com site experienced 16 million user sessions in Q1-Q3 of 2016, a 60% increase year-over-year. Property detail pages on the brand site support Matterport, a past winner of the 2014 Realogy FWD innovation summit, and additional compatible 3D Tours. In coordination with this announcement, Sotheby’s International Realty is also a real estate launch partner forMatterport’s CoreVR release— the largest collection of virtual reality content across multiple disciplines. With the adoption of CoreVR, Sotheby’s International Realty will be able to offer both a 3D and VR experience. Additionally, Sotheby’s International Realty property listings on Mansion Global, the digital luxury real estate destination from Dow Jones, will also be equipped with the 3D Tour feature. Click here for an example of a 3D Tour as shown on a current luxury property listing on theSotheby’s International Realty website. The Sotheby’s International Realty network currently has more than 19,000 affiliated independent sales associates located in approximately 850 offices in 65 countries and territories worldwide. In addition to the referral opportunities and widened exposure generated from this source, the firm’s brokers and clients will benefit from an association with the Sotheby’s auction house and worldwide Sotheby’s International Realtymarketing programs. Each office is independently owned and operated. Given the Manhattanization of Seattle, arguably the fastest-growing metropolis in America, who wouldn’t desire an island escape that’s close yet a world apart from the frenetic energy and congestion of city life? This collection of 172 named islands and reefs in San Juan County have long been a secret getaway for Pacific Northwest families. But increasingly the San Juan Islands have been found by a new generation of affluent homebuyers, so it’s little surprise that the tides are rising. Jones refers to a recent article by Mansion Global entitled “It’s Not Just Chris Pratt and Bill Gates Who Are Flocking to The San Juan Islands,” citing data from Realtor.com listing the island county as the fastest-growing amongst the top luxury housing markets in the US. Despite $1 million+ home sale volumes doubling during the first half of 2016 compared with the year prior, experts suggest the region is still globally undervalued. In the Legacy Homes Report, published by William Hillis, Research Editor and Publisher with RSIR, he concludes that not only are San Juan County homes of similar scale and finish both newer and substantially less expensive than Long Island homes but several Legacy Homes being featured are offered for well below replacement costs. The opportunity to explore these homes firsthand was seized during a recent Legacy Home Tour hosted by RSIR and Wally Gudgell, an Orcas Island resident and real estate broker with Windermere Real Estate. From October 5 – 9th, dozens of brokers and prospective buyers arrived by land, sea and air to visit Legacy Homes ranging in value from below $2 million to $17 million. The lifestyle showcase included harbor-to-harbor seaplane transfer by Kenmore Air, accommodations by Rosario Resort and wine tastings by DeLille Cellars. Gem in the Rough! Spectacular Italian contemporary Villa 3/4 finished needs last finishing touches prior to move in or resale. Potential is endless! Sweeping views of sound from every room: main residence lives on 2 levels with open circular floor plan, top of line appliances included La Cornue custom range. 1200 SF ADU on lower level leads down to outdoor entertaining area/garden; terraced outdoor kitchen with imported Italian pizza oven, 121 feet of waterfront & low bank! Must see! Today’s kitchens are swoon-worthy showplaces of good looks, high performance and sophisticated wizardry. Mass market is out. Fresh design interpretations are in. As dominions of personal expression, kitchens are places homeowners put their signature and showcase their style with handcrafted cabinetry and bespoke fittings and finishes. A recent survey of more than 500 architecture firms by the American Institute of Architects reinforces the role of kitchens as the command center of the home, with a caliber of appliances and appointments that not only reflects homeowners’ tastes but also makes them and their guests feel good. I am thrilled to bring you this week’s event calendar! Your comprehensive guide, take a peek at what’s going on! From Cider Summit Seattle to the San Gennaro Festival and the Boats Afloat Show in Chandler's Cove, here’s what’s happening around the sound. Fabulous Views. Charming Mid Century Maple Leaf home; good bones on level lot. Great views include Mt Rainer, Seattle Skyline, Space Needle, Olympic Mountain Range and Green Lake. Sold "as is." Excellent building site for Spectacular VIEW Home. Minutes from downtown Seattle, Northgate, University District and South Lake Union. Enjoy walks around Green Lake and Maple Leaf Neighborhood. Light Rail coming soon! The Pacific Northwest is home to a diverse collection of communities, dynamic lifestyles and real estate micro-climates. I invite you to discover market trends and perspectives in your area, where every residence is a Realogics Sotheby's International Realty home. 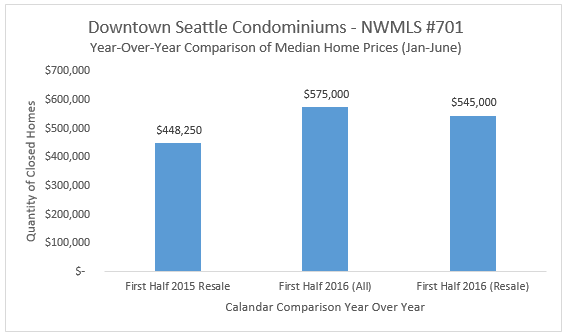 Upon entering the second half of 2016, I offer this timely look at year-over-year market performance in 16 key markets throughout the Puget Sound region. Boasting with enviable economic fundamentals, the Seattle metro area is among the nation's fastest-growing residential markets, with most neighborhoods reaching or exceeding their prior peaks for median home prices. I am proud to keep the good company of leading resident experts who live and work in the neighborhoods they serve, while at the same time, benefiting from a global network like no other. So whether your next home is around the corner or around the world, I'm here to help. So why are qualified potential homeowners choosing to rent? The Puget Sound Business Journal points to low inventory and increasing home prices, but looking to the booming “Silicon Forest” in Seattle also provides some insight. A graph recently released by JLL reveals that millennials are drawn to Seattle for the abundant job prospects, relative affordability compared to other markets, and no state income tax, a vastly different climate than found in an area such as San Francisco. This allure is one of the factors contributing to Seattle’s fastest growing rents and second fastest growing median home prices. While there are many potential buyers currently renting, those who do choose to leverage current market conditions are facing steep competition, as new condominium development projects slowed following the 2007 economic downturn. When the opportunity to reserve or purchase an in-city condo arises, consumers are jumping at the opportunity as NEXUS Condominiums, which will be delivered in 2019, are over 80% reserved. There is still an opportunity to secure a home at NEXUS, and Michael Cannon, Director of Sales, welcomes all current and prospective homebuyers to visit the interim Preview Center at 2715 1st Avenue in Seattle for more information. Realogics Sotheby’s International Realty presents a collection of outdoor luxury homes, stretching from the San Juan Archipelago down to Brown’s Point and beyond. If all we needed from life was a roof over our head, beauty, elegance and the perfect kitchen wouldn’t matter. But we each purchase a home with daydreams of where the kids will play, throwing extravagant outdoor parties for our friends or curling up next to the fireplace with the one we love and a glass of wine. Daydreams become reality in our homes…the place where dreams come true. Foreign buyers in Vancouver will be paying more for investment properties this month (beginning August 2). The Canadian provincial government of British Columbia has enacted a 15 percent real property transfer tax on foreigner-purchased properties in Metropolitan Vancouver, adding $300,000 to the cost of a two-million-dollar home. The tax is the response of Premier Christy Clark’s government to data indicating that foreign absentee buyers have been driving up home prices past the point of their affordability to native B.C. residents. Recent data showed that foreign buyers spent more than CN$1 billion on B.C. property in just five weeks, 86 percent of it in the Lower Mainland. “People who use housing solely as a means to make money rather than living and working in Vancouver should be taxed as such,” Vancouver Mayor Gregor Robertson is reported as saying. Indeed, the restrictions enacted by Australia in 2010 appeared harsh. Those rules prohibit nonresident foreign investors from buying existing homes, and this constraint can only be lifted if they plan to redevelop or build new housing. Relief for temporary residents may be approved by the government before they purchase or build a home; but once approved, such residents can only purchase that one property for their personal residence while in the country. Once it is no longer their primary residence, they must sell it within three months. Yet despite the severity of the law, observers had reported no meaningful reduction in demand in recent years. Your comprehensive guide, take a peek at what’s going on! From the Capitol Hill Block Party and the Kirkland Sidewalk Sale to beer tasting in Phinney, here’s what’s happening around the sound. In June of 2015, RSIR published with The Puget Sound Business Journal a supplement called “The Manhattanization of Seattle,” which again spoke to the imbalance of for-sale inventory relative to the population increases and the maturing Millennial demographic. Sotheby’s International Realty Affiliates LLC recently announced that the Sotheby’s International Realty® brand was the No. 1 real estate company represented in two of the six categories that comprise the 2016REAL Trends/The Wall Street Journal “Top Thousand.” The annual report ranks America’s top 1,000 residential real estate agents and teams based on 2015 annual sales volume and transaction sides, and the top 50 agents and top 50 teams on average sales price—making it a ranking of the top 1,100 nationwide. The Sotheby’s International Realty brand claimed 45 of the top 250 sales associates in the REAL TrendsIndividual Sales Volume category, more than any other real estate company. The brand also had the highest combined individual sales volume from sales associates in the same category. In addition, the Sotheby’s International Realty brand had the most individuals represented in the Individual Average Sales Price category, holding 17 of the top 50 spots (34%), including Brenda S. Powers and Elizabeth L. Sample in East Side Manhattan who tied for No.1 at $37.59 million. The brand also had the No. 1 Team on the Average Sales Price ranking; Drew Mandile and Brooke Knapp Team in Beverly Hills topped that list with an average sales price of $18.3 million. This further establishes the strength of the Sotheby’s International Realty brand as a leader in luxury real estate sales. The Sotheby’s International Realty network currently has more than 19,000 affiliated independent sales associates located in approximately 845 offices in 63 countries and territories worldwide. Sotheby’s International Realty listings are marketed on the sothebysrealty.comglobal website. In addition to the referral opportunities and widened exposure generated from this source, the firm’s brokers and clients benefit from an association with the Sotheby’s auction house and worldwide Sotheby’s International Realty marketing programs. Each office is independently owned and operated.